The Mercedes C-Class has grown up a little, and in doing so has become a force to be reckoned with in fourth generation form. Jonathan Crouch reports. How can it be that the car that Mercedes-Benz calls its best selling model has, for so long, felt a bit of an underachiever? The C-Class ought to have been all that the company knows about luxury saloons distilled into a smaller form, but for many years it was instead a car that was short on quality and long on price tag. The 2007 model repaired much of its reputation and the subsequent 2011 facelift brought even more features and better efficiency, but in this country, the C-Class always lagged a distant third in the compact executive sales charts behind the BMW 3 Series and the Audi A4. Much has changed in the interim though. The introduction of a smaller four-door saloon, the CLA, has allowed the C-Class to become a bit bigger and a good deal more luxurious. The current MK4 model is a fresh design from the ground up and it shows. BMW and Audi will need to be at the top of their respective games to keep this generation C-Class on the third step of the podium. 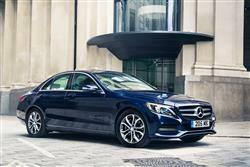 The C-Class has for some time been, and will continue to be, focused on comfort and refinement. It's clear that this is where a good deal of the development budget has been spent in differentiating this generation car from the BMW 3 Series, the Audi A4 and the impressive Jaguar XE. To that end, it's the first car in its class to offer air suspension. This comes with an AGILITY SELECT switch that allows the driver to select between Comfort, ECO, Sport, Sport+ and Individual settings. Even if you stick with the standard steel springs, the front suspension has been greatly improved with a very clever four-link setup that isolates the struts, allowing for optimised geometry and better grip. The diesel engines begin with a Renault-derived 1.6-litre diesel unit that develops 136bhp in the C200d model. Next up is the 2.1-litre diesel unit, offering either 170bhp in the C220d or 204bhp in the C250d: with both C220d and C250d derivatives, there's the option of 4MATIC 4WD if you want it. If you need a bit more technology, there's a C300h hybrid model that combines a four-cylinder 204bhp diesel engine with a compact 27bhp electric motor and looks interesting. Alternatively, there's an even more sophisticated C350e plug-in hybrid model that mates 211bhp four cylinder petrol power with a 27bhp electric motor. Talking of petrol power, it comes in a simpler guise in the form of the 184bhp C200. There are Mercedes-AMG performance petrol models too. The C 43 gets 4MATIC traction and a twin-turbo V6 engine putting out 367bhp. It's the perfect choice if you can't quite stretch to the range-topping Mercedes-AMG C63. If you can afford this flagship though, you'll be getting quite a car, with a 4.0-litre V8 putting out either 476 or 510bhp, depending on the state of tune you select. Back in the real world in the mainstream C-Class line-up, there's a choice of two six-speed manual transmissions. Auto buyers get either 7 or 9-speed G-TRONIC units, depending on the derivative chosen. The electromechanical Direct Steer system is also fitted as standard.